I used to assidulously read “Peanuts” cartoons when I was a kid, but the religion in them—and apparently there was quite a bit—went over my head. Atlantic has an 2016 article called “The Spirituality of Snoopy,” which recounts how often the artist Charles Schulz used religious themes in his strips. More than 560 of Schulz’s nearly 17,800 Peanuts newspaper strips contain a religious, spiritual, or theological reference. To put this into perspective, Schulz only produced 61 strips featuring the famous scene where Lucy pulls the football away from Charlie Brown as he tries to kick it. Particularly later in his career, the religious references came so frequently that pastors and religious publications regularly requested permission to reprint Peanuts strips, which Schulz almost always granted. Later in his life, Schulz’s began to refer to himself as a “secular humanist,” as his theology became less traditional. This did not mean he was no longer a Christian, but rather that he now believed other faiths might also provide legitimate paths to God. He was also less certain about other Christian doctrines, such as the existence of a literal heaven. The more Schulz wrestled with faith, the more he led his readers to do the same. In a 1985 strip, Sally asked Charlie Brown, “When we die, will we go to Heaven?” Charlie responded, “I like to think so.” This mixture of hope and skepticism reflects Schulz’s own evolving faith, which came to assume an increasingly central role in his work. When you map religious references in Peanuts over time, the trend line shoots up and to the right. This entry was written by whyevolutionistrue and posted on August 10, 2018 at 12:30 pm and filed under cartoon, theology. Bookmark the permalink. Follow any comments here with the RSS feed for this post. Both comments and trackbacks are currently closed. Schulz was famously ambiguous. I never did figure out whether Linus’s lonely vigil waiting for the Great Pumpkin was promoting or making fun of faith. Or something else — it certainly is ambiguous. Linus in the pumpkin patch seems to resonate with many themes one doesn’t usually associate with the funny pages: hope, longing, alienation, thoughtfulness, yearning. Yet the Great Pumpkin business doesn’t come off as heavy — maybe because of its naivete. I have to admit I have — and had even as a kid had — a temperamental affinity for Linus (which might be a reason that I, like Gnu Atheist in comment 6 below) find his stage sermonizing so cringeworthy. I do draw the line at that oral fixation of his, though. At least he never went full-on Johnny hart. Ugh. I’m old enough to remember when B.C. was funny. My blog title and strap line refers to Linus’s apparently inexplicable worship of The Great Pumpkin. 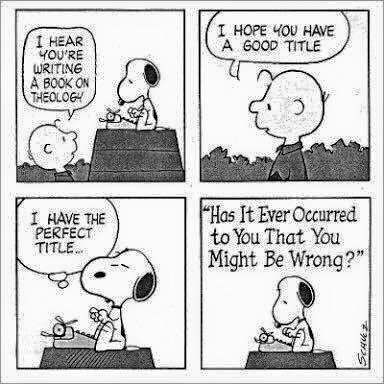 I see as Schulz as a sceptical believer, so I think this represents the ‘miracle of theism’, as Mackie put it. Maybe the bible was written by a dog? We have to consider all the possibilities. Yes, the whole thing was written backwards which is why its’ impossible to get one non-contradictory message out of it and why the Bible Code is real. My wife & I watch ‘A Charlie Brown Christmas’ every year over the holidays (as well as the Grinch and a few other favorites). 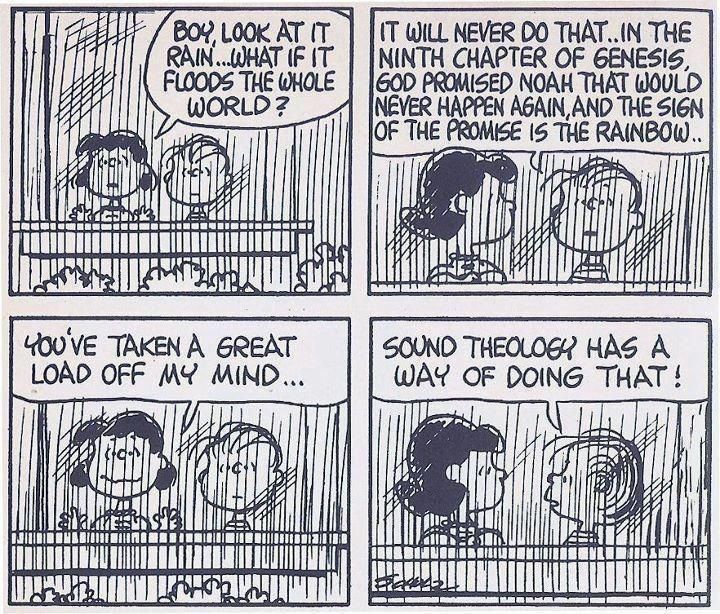 It’s a great cartoon with lots of nostalgia, but I always cringe a bit when Linus does his sermon on the stage. It’s part of the story and I guess it was important to Schultz at the time. It’s a Christmas show, after all, so I put up with it. For reasons of nostalgia, I tolerate a lot of nonsense at Christmas I wouldn’t the rest of the year. I put up with it because o/w there would be no Great Pumpkin. I always dug the Vince Guaraldi scores on those Charlie Brown specials. Indeed. They’ve already entered the canon of jazz standards. Do not do / watch christmas stuffs. our heathens’ greetings to All. Then. Christmas often seems to be the least problematic holiday for people outside the orbit of classical Western Christian orthodoxy. As I’ve gotten older and more aware of religious issues, Linus’ little sermon on “the true meaning of Christmas” pisses me off. I grew up celebrating Christmas in a nonreligious household. Christmas was never treated like a Christian holiday — it was about joy, love, charity, food, family, Santa, presents, and beautiful decorations. Even when I was a child, then, I would feel a bit ashamed at the end of “Charlie Brown’s Christmas.” I was apparently missing the TRUE meaning. One year I asked for a manger scene. Our family celebration needed fixing. Today I consider Linus’ sermon as propaganda. Oh sure, he was contrasting humble piety with greed and over commercialization. Fair enough. But by ignoring the humanist elements hes tacitly incorporating them into Christianity. Not fair. A rather lame though popular book was published in the 1960s entitled “The Gospel According to Peanuts” by Robert Short (not the Hollywood make-up artist by the same name). The book was the best-selling non-fiction book in the U.S. for the year. Insiders knew that Short had been a student at a theological school (not when he was at Perkins but either when he was U of Chicago or Garrett Evangelical)- in which one of the professors often commented on Peanuts in his lectures and strongly suspected that Short had cribbed a modest amount of the book from these lectures. Short eventually became convinced in belief in universal salvation for everyone and expressed this belief in his book “Something to Believe In: Is Kurt Vonnegut the Exorcist of Jesus Christ Superstar?”. (He was a good friend of Kurt Vonnegut.) About 25 years after the Peanuts book was published RS became a Presbyterian minister. Given that Charles Shulz lived in Sebastopol, CA, about 75 miles from where I live, there is a Charles Shulz museum there which I hear is pretty good. Since I vacation in nearby Sonoma almost every summer, I really should get over there some time. I concur with previous comments that the religiosity of th strip and of the Christmas special are cringeworthy, though I continue to enjoy both formats when I chance upon them. I tolerate them for one personal reason; my grandmother. I have such fond memories of sitting on her lap while she read Peanuts, Hagar the Horrible, Blondie, and the all the other “funnies” to me. I cannot recall ever feeling safer or being happier than when I was with my grandmother, and I won’t let a little religion get in the way of those wonderful recollections. The Charlie Brown Christmas ending was a huge WTF moment for me when I was a kid. I was an atheist kid even before I knew about the huge garbage pile of garbage found in the Bible. All I knew about was the “candied down” version of the Bible. Then I read some Carl Sagan stuff later on that pointed out some of the garbage. Another WTF moment.